Solar Panel Troubleshooting - Where to start? I have a '04 Brave and have just upgraded my converter with a Progressive Dynamics PD9260C and new house batteries. Ultra Trik-L-Charge is also installed and the last thing I want to look at is the solar panel operation. I have the factory installed 10watt panel but it has been a long time since I saw the "charging" light glow on my status panel. Where do I start with troubleshooting the system? At this point all I know are the locations of the panel, the charge status indicator and the 15A "solar breaker located in the stairwell. Are there other components that I have to access to verify operation, if so, where are they located? What are appropriate voltage levels at the 4 wires that come into the charge status board? Not much there, it looks like 2 or 3 diodes and an LED. Re: Solar Panel Troubleshooting - Where to start? Check the wires on the charge status light. 2 are connected tot he battery and 2 to the solar panels. There shoud be battery voltage on the 2 from the battery and about 15 to 17 volts on the 2 from the solar panel. If not there, the panel is bad. Of course the sun must be out for this!!!!!!!!!! If you look at this picture (assuming you have the same tank monitor display circuit board), you will notice the circuit board printing with in ing out outg - measure the voltage on the in and in ground (pins 1 and two on the plug.) 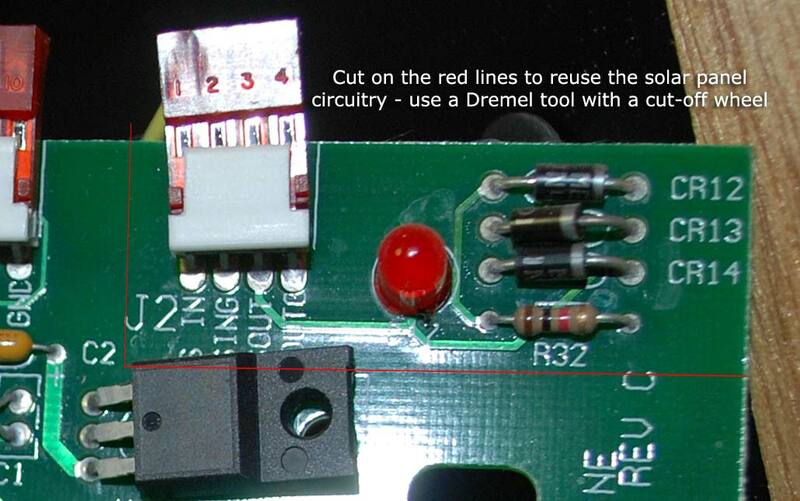 You should be seeing 15-18 volts or more (open circuit voltage) with the plug removed from the board. Also make certain the DC circuit breaker isn't tripped. Let us know what you find. My status board is not exactly the same. Its labeled "Ventline" and on the backside the PN on a paper tag is L5121-01 EL/AH. The voltages measurements at these pins remain the same if the status board is plugged in or not. All Voltage measurements made while the coach was operating on battery power, charge indicator light does not glow at all. Sounds like the panel is working. Can you meter across the LED? There should be a dropping resistor in series with one of the LED leads. Negative meter lead to the negative side (shouldn't matter where you pick up a ground), positive lead to both sides of the resistor in series with the LED. You could try simply measuring the voltage across the batteries with no other charger operating (IE converter) and then again after you cover the panel. If you get a higher voltage while charging (after letting the battery rest between tests) that should tell you whether or not the panel itself is doing the expected job. You may simply have a burned out LED which can be replaced. Stu - the panel is only 10 watts so he might not see any difference covered or uncovered. I'm also wondering if the LED isn't bad. True John, but one could always disconnect the battery and check voltage on the battery leads alone. He did mention seeing 19V while the panel was exposed to the sun but..... I would not expect to see voltage that high at the battery, perhaps around 14.5 or so but definitely over 12.5 or no charging would be taking place. I'm not familiar with the exact set up, but with ~ 19 V input the output should read about 18.5 V when the positive wire to the battery is disconnected from the battery. If not, then a diode (round component about 0.5-0.75 inches long with one stripe) on the board is probably bad. All I would think the board does is isolate the battery from the solar panel when there is low or no output from the panel. That only requires one diode with the cathode (stripe end of the diode) connected to the battery (opposite end of the diode goes to the panel +). There is probably a resister ( round with multiple stripes) in series with the indicator diode (LED) as well that could be bad or have a bad connection. (both of these would be in parallel with the main diode; the breaker may be anywhere in the main circuit).